On a warm sunny day, Roncesvalles easily ranks as one of my favourite streets for a little food shopping. There's a lively atmosphere with local grocers, butchers, bakeries and cafes all competing for the neighbourhood's attention. One of the spots I like to stop by is Maple Produce, a small but bustling purveyor of fresh fruits and vegetables. 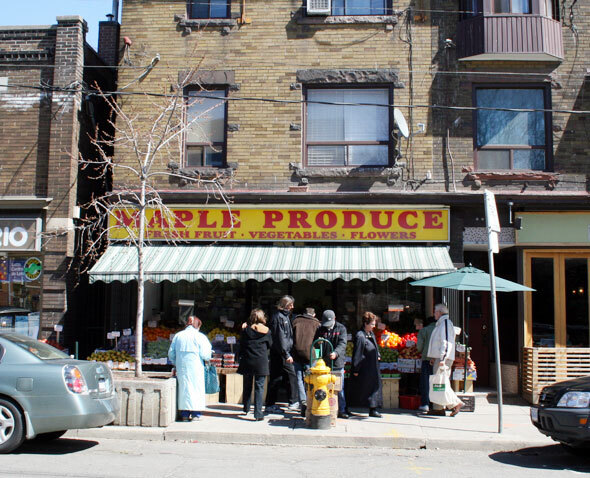 There's plenty of small produce stores littered throughout the city, but Maple Produce holds its own by consisently delivering fresh food at prices lower than most of the competition. On a recent visit, I filled my basket with some good looking avocados, kale and tomatoes; and thought long and hard about corralling something from their wide selection of freshly cut flowers. Here's a photo of the outside of the store. It's pretty unassuming, nestled between the Friendly Thai and a Lottario outfit.